Erin Hoover’s poem “Temp” featured in the first issue of Spry Literary Journal. 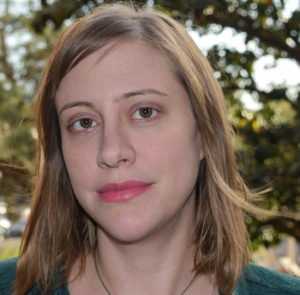 Jennifer Martelli recently had the opportunity to interview Erin about her writing process and her world as a poet invested in the literary community. They discussed her fascinating, haunting poem that features a car rental shop, a store-bought cake, and cannibals! Jennifer Martelli: “Temp” is a fascinating poem, chilling in the best way, because it’s set up to be so ordinary, that the weight of the ominous is like “a full-body smack.” The poem is really two stories: the speaker’s story and the lady with the grandson. What is the origin? What compelled you to write this poem? Erin Hoover: “Temp” came from the realization that almost everyone I know has had early in their career, once they have a career in which they now feel trapped: like in the Talking Heads song “Once in a Lifetime,” how did I get here? When this happened to me, in my mid-thirties, I started feeling really nostalgic for the temp jobs I used to work in college, one of which was as a receptionist at a Volvo dealership. There wasn’t anything especially great about that job either, but at least I was only filling in for someone else, the woman whose photos decorated the desk. I remember looking at pictures of that kid and feeling sorry that eventually he, too, was going to have to go to work. I felt at the time (and still feel) that work as we experience it in late capitalism is the Moloch to whom we feed our children, but I also didn’t know at the time how bad it was going to get for me. JM: I so admired the ability to have plastic champagne flutes with cannibals in the same poem! Can you talk about some of your craft choices–your seamless lineation, your imagery. Was the journey from draft to finished product a long trip? EH: Thank you for noticing the lines and images in “Temp”! My goal is usually to create a regular, even line that at the same time will propel the poem. I also want to make every image surprising, which involves a lot of revision. It’s not hard to come up with an image that does some work but doesn’t really fire the imagination. I rewrote this poem several times and over a number of years because I kept working at what question I was trying to answer with it and how to clarify the question through image. I was really happy when the editors at Spry liked the poem. JM: What is your writing process like in general? Do you start with a subject? Or a more abstract idea? EH: Usually I start with something that fascinates me in a way that I can’t quite nail down, at least in my conscious mind. With this poem, it was the sudden yearning I had for a temp job I’d held years earlier. Like: seriously, Erin, you miss the Volvo dealership? Through writing the poem I realized that it was that point in my life that I missed, but then there was another question, why? What did this tell me about my current situation, and then more broadly, how I felt about work? JM: Do you have a writing group/community? JM: Which brings me to your “Late Night Library.” Poetry needs these groups. Can you talk about this wonderful project? EH: I helped start Late Night Library in 2011 with Paul Martone, its current director. Paul and I were colleagues in University of Oregon’s MFA program, but years had passed since we graduated and I think we were both starving for the opportunity to talk about books again. Though Late Night Library runs a variety of programs now, the initial idea was to do a regular podcast about debut poetry and literary fiction because books with small press runs in which the author doesn’t really have an established, marketable “brand” aren’t often stocked by bookstores and don’t fare well in Amazon’s algorithm, and so you have to seek them out. Paul and I both liked the idea of being “activist readers” in addition to being writers ourselves. Paul was part of the literary community in Portland, Oregon, and I was in Brooklyn, so there was the added appeal of connecting these physical places in the digital sphere. JM: Who are your muses? Who moved you to write early on? EH: “Early on” for me is about two decades ago now, and I started by reading feminist confessional poetry like Anne Sexton and Sylvia Plath; later on I got really into Adrienne Rich. I’m also inspired by science fiction and Ray Bradbury has probably been one of my muses for the past few years. I really like the idea of creating an imaginative future or alternate reality that informs or lays bare something unspoken in the real present. JM: Who are you reading now? EH: This summer I’ve been going on walks and bringing a different book of poems with me every day. On the last walk I was reading Theodore Roethke, before that it Frank Stanford and Mina Loy and Yeats. I haven’t read Richard Siken’s new book yet but I am excited about that. JM: Where can we read more of your work? EH: I have poems coming out soon in The Pinch and Crab Orchard Review. You can also read my poem “What Is the Sisterhood to Me?” online in Prairie Schooner, and listen to a recording of me reading recent poems at Florida State University’s Warehouse reading series. JM: What’s next for you? Any projects? Manuscripts in progress/out/ready to go? EH: I’m currently the editor of The Southeast Review here at Florida State University. Also, I am trying to publish my manuscript of poems, which is called Barnburner and kind of circles around the question, Does emotion have a kind of materiality? What is the end result of trying to live in an economic and political system that creates so much unhappiness and suffering, like where does that energy go? If anyone wants to keep up with me, one way is to follow on Twitter. Jennifer Martelli lives and writes in Massachusetts. She is a poet, associate editor, mom, paddle boarder. Check out her stuff on her website.